Sapphire is one of the 4 precious stones, along with diamond, ruby, and emerald. All other gemstones are semi-precious. This, alone, tells us that the sapphire is a very special stone indeed. In fact, although modern ways tell us that diamonds are the most precious and sought-after of all precious stones, it is actually sapphire which has long been the ultimate prize. Like all gemstones, history and mythology go hand in hand where sapphires are concerned. Where sapphire is a little different is that it plays an important part in many cultures and civilizations across the world. The ancient Greeks believed in its power. 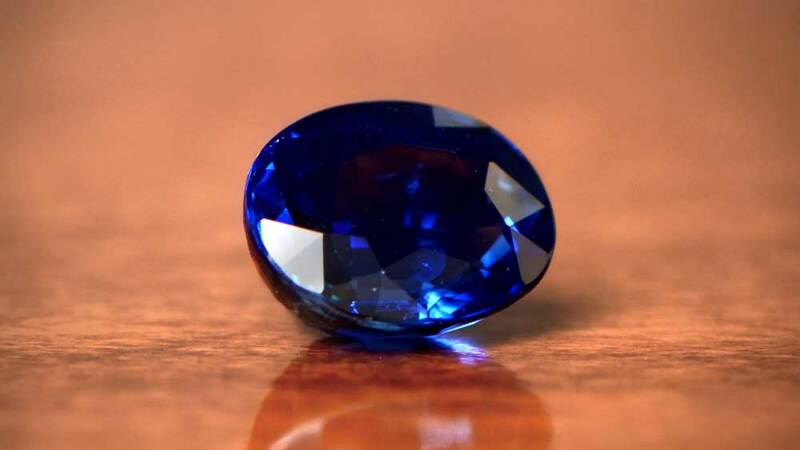 In ancient Persia, people believed the sky was blue because the earth was supported by a giant sapphire. Sapphire also has several mentions in the Old Testament. More generally, ancient civilizations believed sapphire wearers had both protection and unbreakable fidelity. Were an adulterer to wear a sapphire, the stone would immediately turn black. The major sources of sapphire have changed several times over the millennia. As one source has become exhausted, so another has become a prime location. South East Asia has been producing sapphires since ancient times and is still the source of very high-quality stones. Sri Lanka (formerly Ceylon) also produces high-quality sapphires. The US and Australia are relative newcomers to sapphire mining but have also produced some exceptional examples. Unusually for gemstones, sapphires occur across all continents with the exception of Europe. Sapphire is a variety of the mineral corundum. It is the presence of trace elements of titanium and iron which gives sapphires the deep blue color they are most associated with. Other trace elements produce different colored crystals. 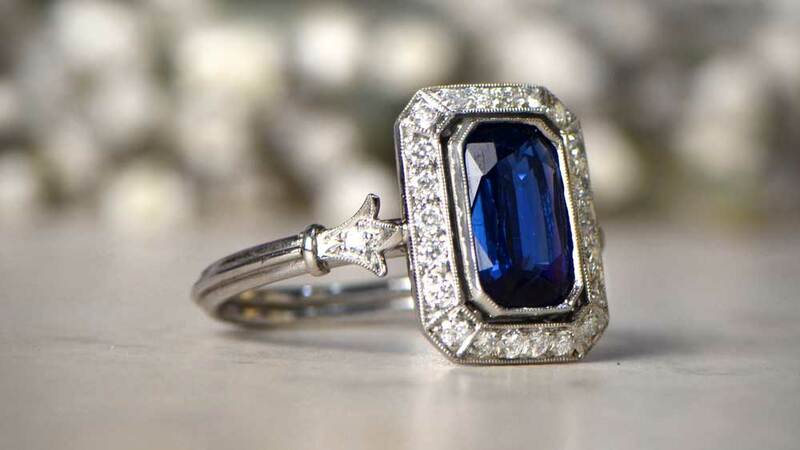 In fact, sapphires occur in just about any color imaginable, but blue is by far the most sought-after color. Heat treatment is common to improve the color and to reduce the visibility of inclusions within the stone. The majority of sapphires available have been heat-treated. Non-heat treated sapphires are extremely rare and carry a sizeable premium compared to equivalent heat treated stones. Corundum is the crystal form of aluminum oxide. Typically it will contain traces of one or more of iron, titanium, vanadium or chromium. Each level of trace-presence will determine the color of the stone. If chromium alone is present, the result is a deep red color. Despite this, there is no such thing as a red sapphire. Instead, sapphires carrying this red color are rubies. Rubies, with the exception of the inclusion of chromium, are chemically identical to blue sapphires. 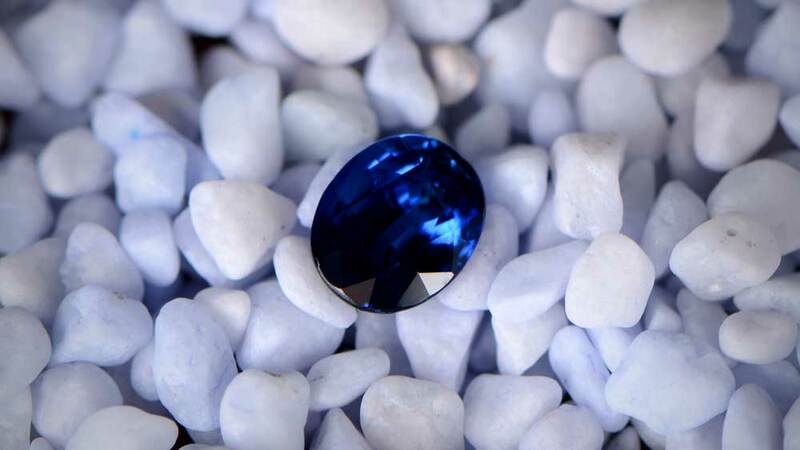 Blue sapphire color is graded on the presence – or lack – of violet, purple and green hues. Violet or purple, up to 15%, produces high-quality stones, with the presence of green being a considerable negative. All colors other than blue (and the red of rubies) are fancy sapphires. These do not carry the same value or desirability as blue sapphires. Sapphire is graded as 9.0 on the Mohs Scale of Hardness. This makes it the third hardest known mineral, after diamond and moissanite. As one of the four precious stones, sapphire has a special place in jewelry of all types. Its deep blue color makes a spectacular contrast to diamonds, but sapphires also suit a single stone setting perfectly. There is no official grading system for individual sapphire stones, and the color is usually the defining factor in any valuation. As long as a stone has reasonable clarity, it is suitable for high-end jewelry. 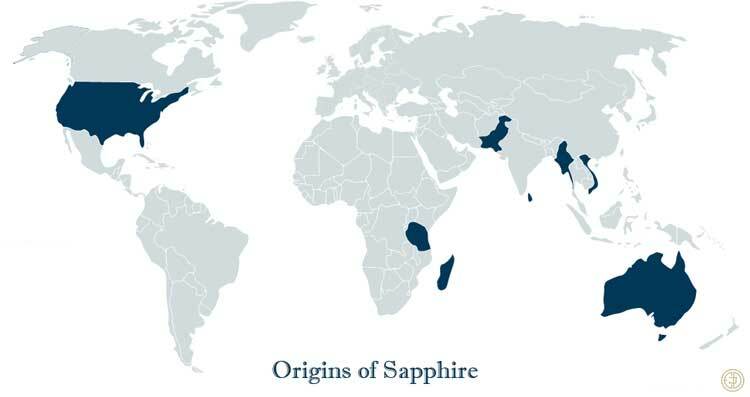 Sapphires from Burma, Sri Lanka, and (especially) Kashmir are those which carry the highest premiums based on color and overall quality. Good sapphires don’t generally come cheaply. That, though, doesn’t mean they are all unaffordable for the average budget levels. It may be that you need to consider a smaller stone in order to get the quality you would like. One thing to avoid, unless your budget is especially tight, is stones that have been fracture filled or treated with surface dyes of any kind. Although this means lower quality stones do look better, such treatments will usually cause issues at a later date. As well as reducing any sell-on value, dyes fade and wear off, and fractures back-filled with glass are very susceptible to heat or even impact damage. Look to present the sapphire by using a halo or other creative setting. Usually, smaller diamonds for use in halos or pavé would be less expensive than trying to fill space with a larger sapphire. Blue is a color that is actually not well seen by the human eye. The blue light that we see suffers 10 times the level of natural “scatter” than that of red light. This makes it more difficult to establish one shade of blue from another. 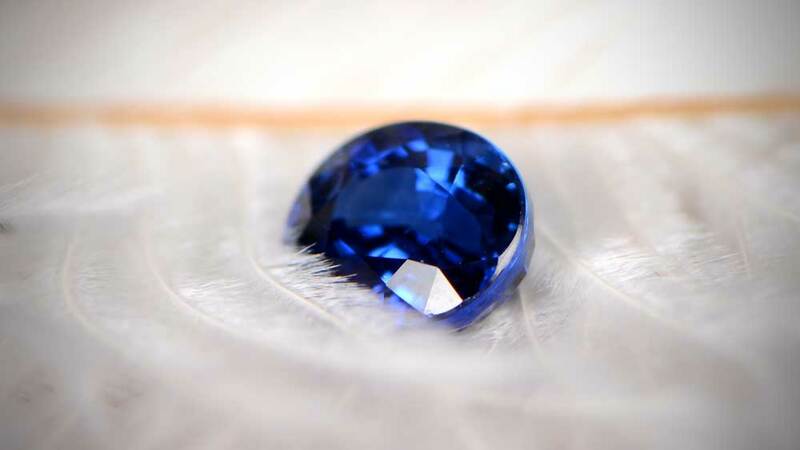 To see how blue a sapphire is, you should compare it to others. This will make any excess purple, violet, or even green, shades much more obvious. Despite its hardness level, the surface of a sapphire is very prone to chemical damage. If cleaning at home, use only warm and mild dish soap. Never use any commercial cleaning products, unless specifically formulated for jewelry which includes sapphires. If a single stone setting, ultrasonic and steam cleaning are both appropriate, and will not damage the sapphire. If the stone is dyed or fracture filled, both the latter treatments may cause irreparable damage. But, keep your sapphire engagement ring clean and it will last you a lifetime. If you are looking for a ring with the September Birthstone, Estate Diamond Jewelry has a large collection of rings for you to see.